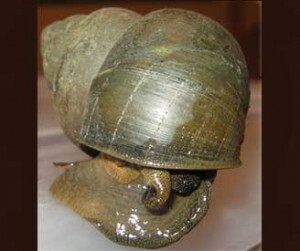 Freshwater snail that has an operculum that acts as a lid or trapdoor and seals the shell’s opening; typically has dark green covering similar to moss; color is brownish to olive-green. 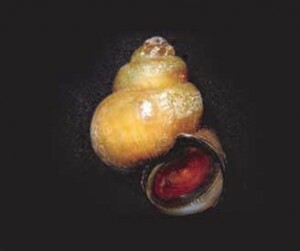 A similar species the Japanese Mystery Snail (Cipangopaludina japonica) is also established in Nebraska. 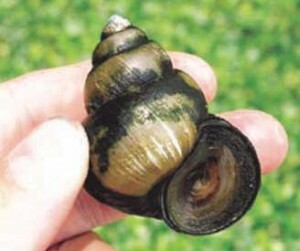 Identified in several reservoirs (Wehrspann, Pawnee, Walnut Creek, Holmes, Wagon Train, Wild Plum, Branched Oak, Mahoney State Park, Hitchcock Park, Biology Pond – Crete, Hedgefield, Halleck Park – Papillon), Big Blue River, wetland off S. Loup River, and the Missouri River near Sioux City. Introduced through aquarium and Asian food trade, aquarium dumping and accidental release from aquaculture farms. Spread if transported in bait buckets, live wells, bilge, boat hulls/motors/engines, and other equipment. Can compete with native snail species. Potential vectors for the transmission of parasites and diseases. Shells can clog screens and water intake pipes. Recent research suggest they are filter feeders which can lead to competition with native mollusk and fish species.